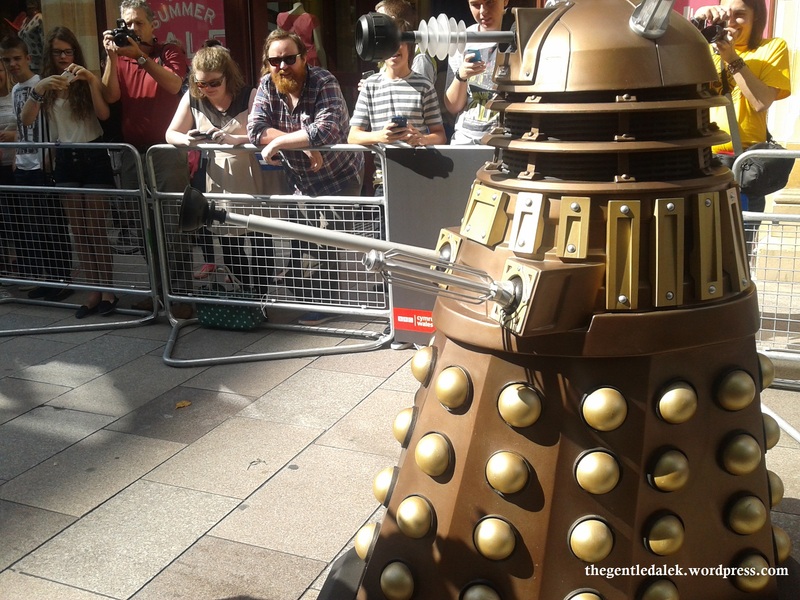 As I have mentioned in a few of my blog posts I unfortunately didn’t get tickets for the Cardiff premiere of Doctor Who Series 8 which is part of the promotional world tour leading up to 23rd August. 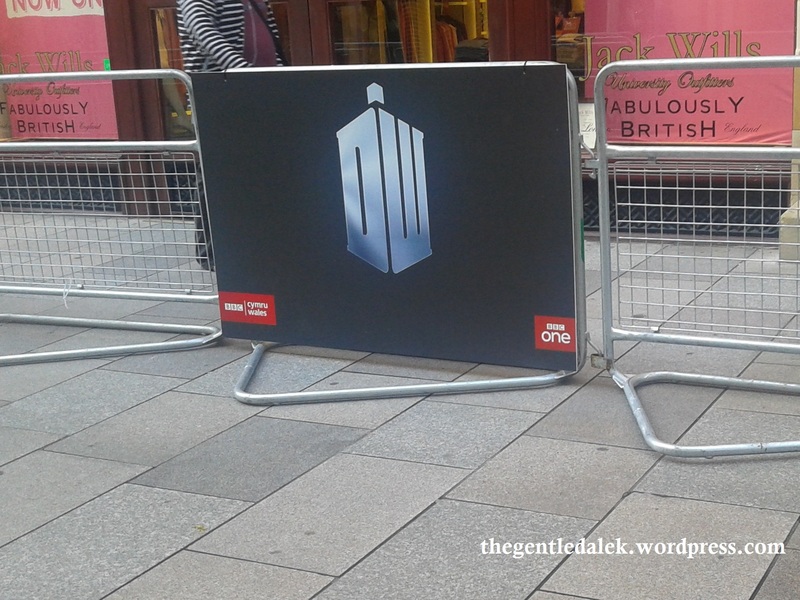 Over the last few days I had heard that there was going to be a “red carpet” from Cardiff Central Library to the venue of the premiere itself, St David’s Hall. 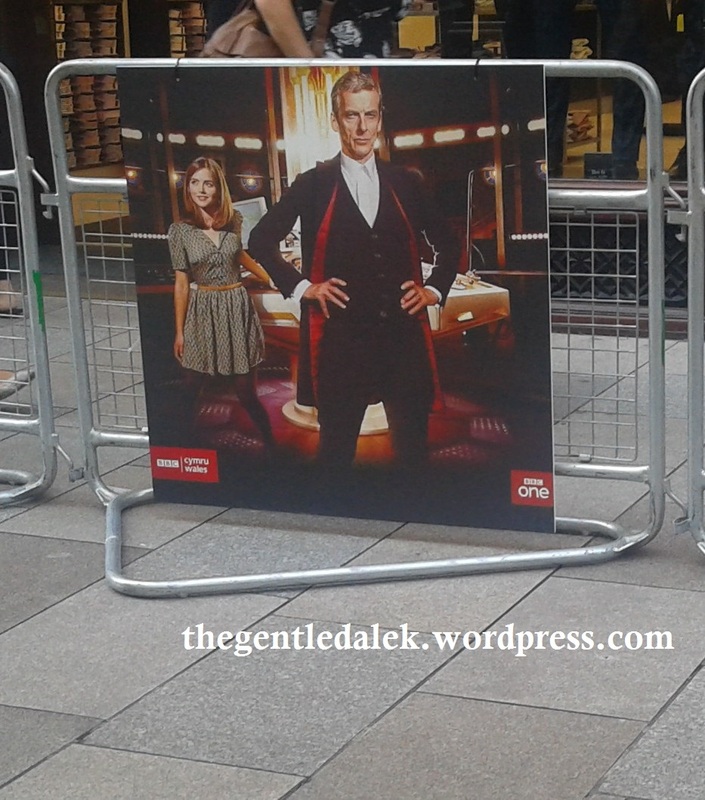 As I didn’t get tickets for the actual event, I thought I’d head down to The Hayes this morning and watch the red carpet part to try and get a sneaky glimpse of Peter Capaldi and Jenna Louise Coleman. 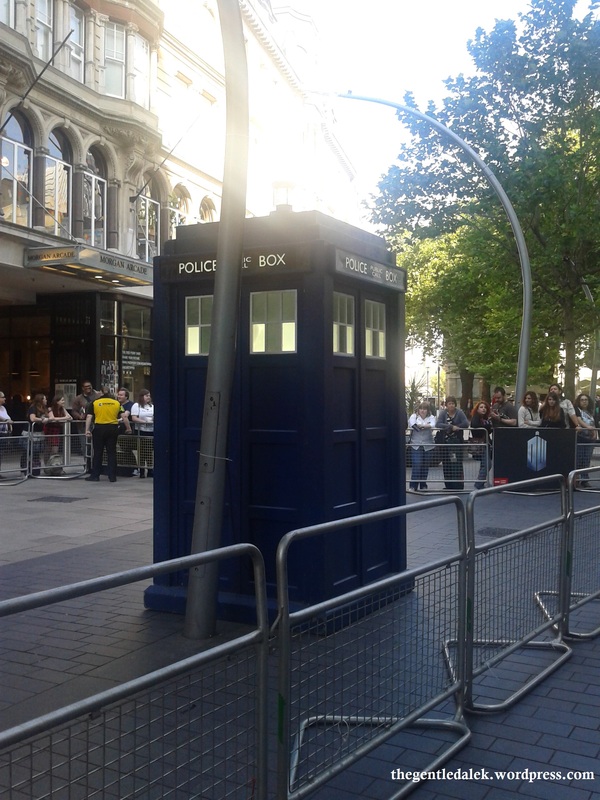 I got there about half 9 as I anticipated crowds to already be forming but to my surprise it was fairly quiet apart from a group already standing by the section with the Tardis in it. 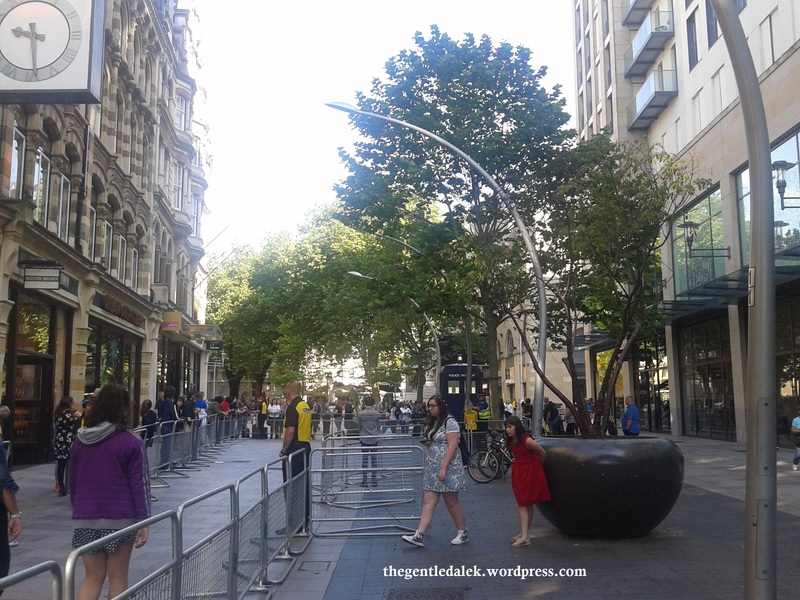 I walked a bit further so that I was at an emptier section about halfway between the library and St David’s Hall and stood by the barriers. 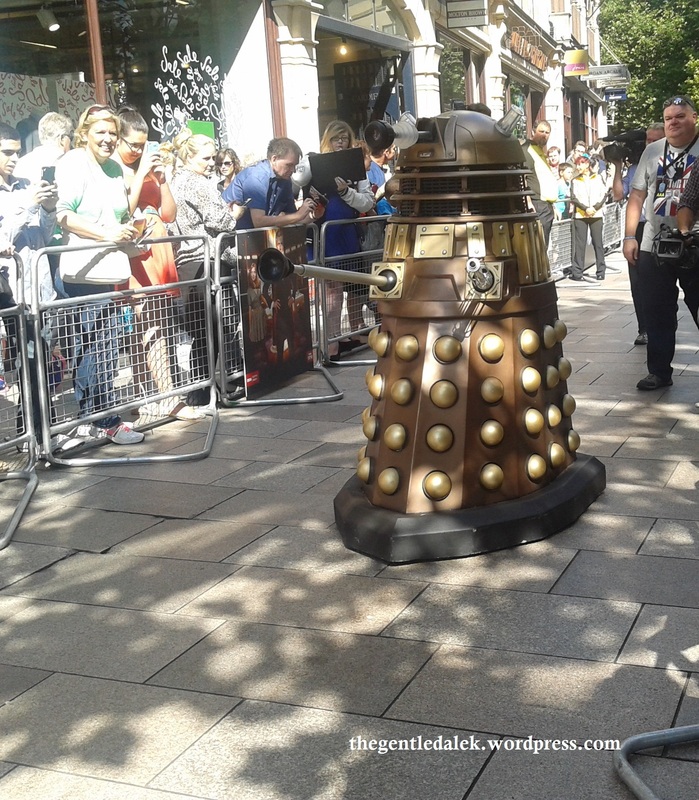 At about half 10 cybermen and daleks started to parade down the route and this is when it got a lot busier so I was lucky I got there early! Eventually sometime after 11 the stars began walking down the “red carpet”. This is not my typical written blog post. I took quite a few pictures this morning partly for myself but also to upload on here so that others who couldn’t go to the premieres could have a glimpse at what it was like. Lucklily my phone battery managed to last long enough for me to get all the photos I wanted! Click on the Continue Reading tag below to see the photos. A view up The Hayes in Cardiff. Spot the Tardis! 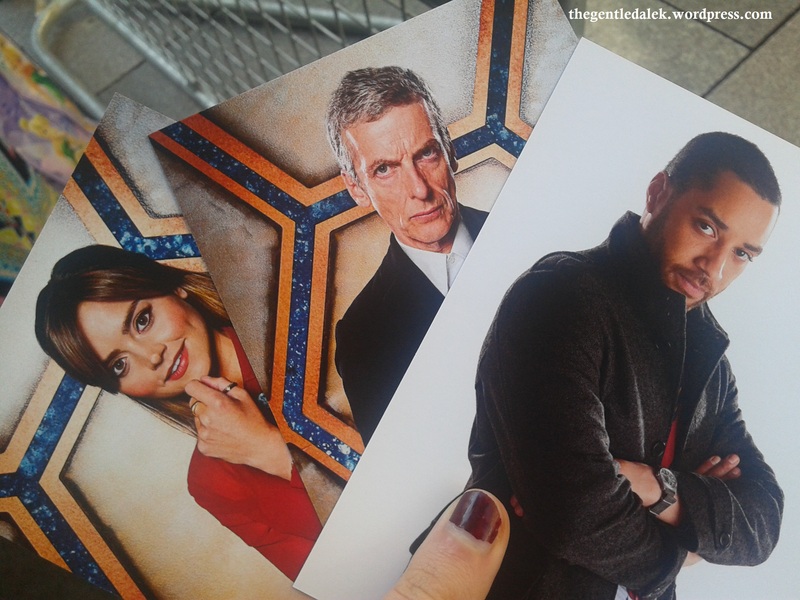 The promotional postcards we were given. Some lucky people managed to get theirs signed! I really wish I got the whole of this picture in but it was really sunny and I couldn’t quite see what was in the frame. 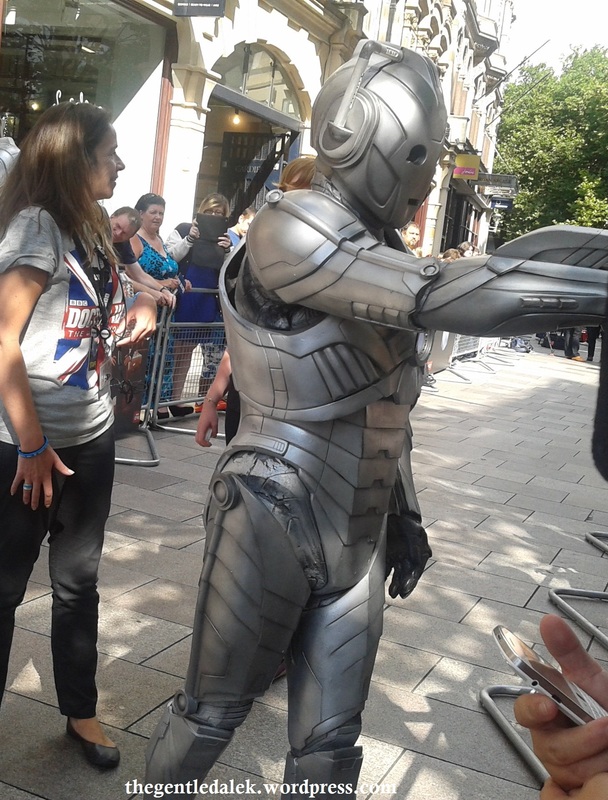 This was meant to be a photo of a cyberman and a dalek having a standoff! 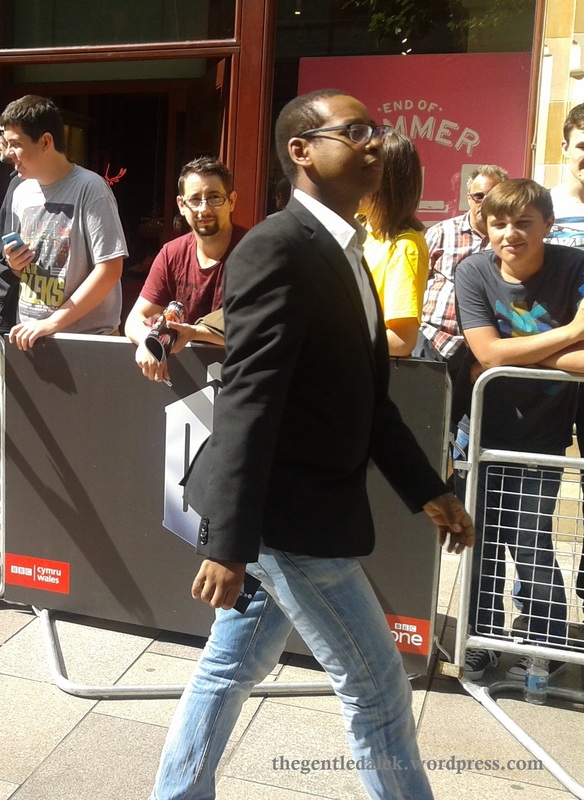 BBC Entertainment correspondent Lizo Mzimba. I was probably more excited than anyone else about seeing Lizo. Jenna Louise Coleman. 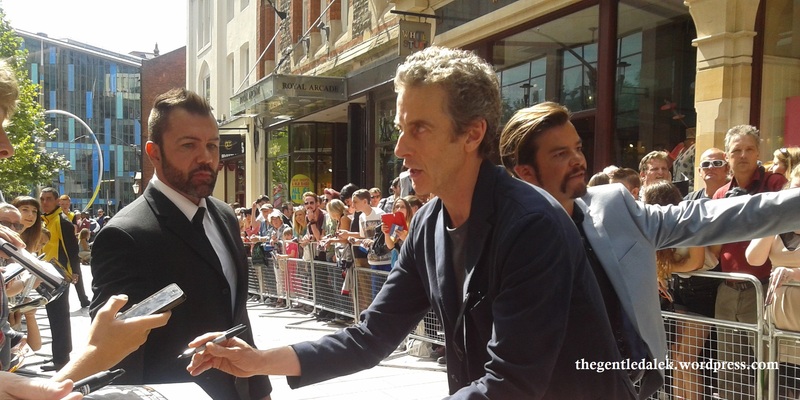 Unfortunately she was rushed past us by bbc staff and couldn’t sign anything for us because they were running late. 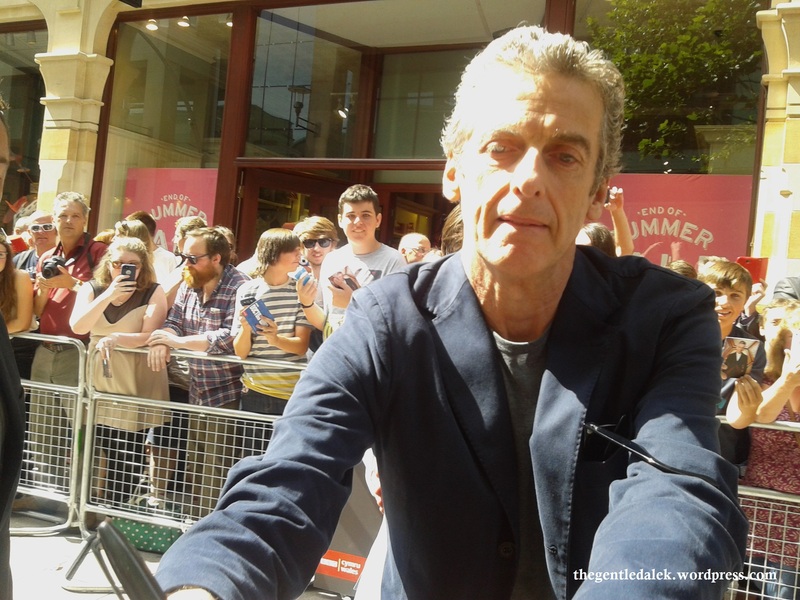 The man everyone was waiting for: Peter Capaldi! 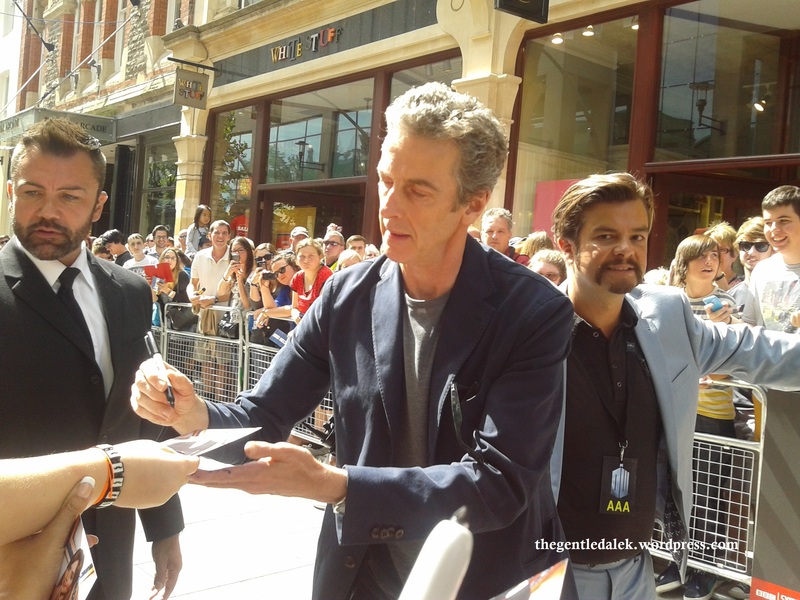 Peter seemed really nice and tried to sign as much stuff as he could for fans despite being ushered on by bbc staff.